I’ve seen my future – many would say my present – and I think I like it. Fast but considerate bike racing, no suicidal moves, clever tactics and a right old tear up to the finish line… veteran racing rocks! 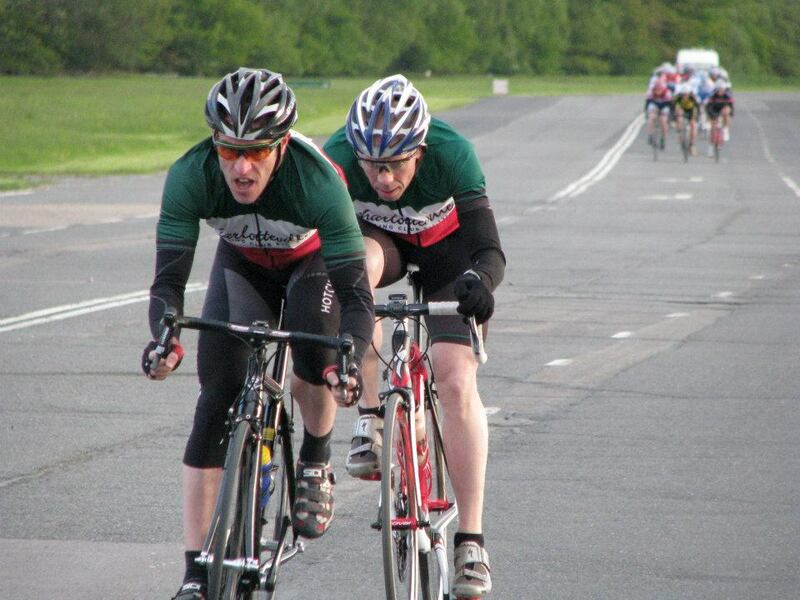 To be fair, I base this view on the evidence of just one event, Wednesday’s second edition of the new Surrey League vets series at Dunsfold. Time and familiarity may temper my unbridled enthusiasm for the veteran format, but for now the expression ‘so far so good’ scarcely does it justice. I had an absolute ball and was still grinning like a loon as I stepped back into my house after the drive home. Don’t think for a moment that this is because it was easy meat; quite the contrary. The average speed of the race was more than 2mph quicker than the previous Friday’s 4th Cat event (a little about that later), which doesn’t sound a lot but makes quite a difference when you’re in amongst it. The early laps, when what proved to be the winning breakaway formed, were the toughest I’ve had in any race, blindingly quick (every glance down at my speedo indicated north of 30mph), leaving me hanging on for grim death. And that was with my legs feeling as good as at any time since I started racing! Thank heavens I had good form, otherwise I’d certainly have suffered the ignominy of being dropped despite my relative youth compared to many others around me. The break itself was a masterstroke by the two Charlotteville CC riders present (and pictured above). As we readied ourselves for the start no-one paid them much attention, despite them positioning themselves a bike length or two ahead of anyone else. Then, as we all faffed about, clipped in and rolled off they stepped straight on the gas, instantly forging a lead of 30 or 40 metres. I slotted in quite near the front as the bunch took shape and, if I’m honest, I assumed they’d ease up and drop back into the pack – an assumption that cost me any opportunity I might have had to join in the fun. When it was clear this was a premeditated move and not a mistake, a couple of others set off to bridge across, but most of us sat tight; it was very early in the race after all. Crucially, riders from Brighton Mitre and VC Meudon, the two best-represented teams in the race, then got into the break, allowing their colleagues to block and disrupt the chase. Thankfully the race then settled down a bit and the cat-and-mouse of chasing the break began in earnest. Having recovered well from my mini-crisis I started to ride smoothly and confidently, even contributing a few pulls on the front once a bit of through ‘n’ off had been organised by the Southdown Velo guys, none of whom had made the break. The chase evaporated with a couple of laps to go, when it was clear the break wasn’t going to be caught. I busied myself for the minor place sprint and, as the bunch sped round the final bend, I placed myself on the wheel of a big, powerful chap from the Brighton Excelsior club who gave me a lovely tow. My ‘sprint’ took me past him even though I still couldn’t force myself out of the bloody saddle, then I kept up the pace until about 75 metres out, when the afterburners failed to fire and I slipped back a bit. I finally finished 14th in my under-50s category, respectable enough when the first five finishers were among the breakaway artists. That’s all well and good, but why, I can hear you ask, was it quite such a wonderful experience? Simple. Throughout the entire race I was able to ride in the bunch with almost total confidence in my fellow competitors, allowing me to concentrate on my bike riding rather than fretting about my imminent demise amid a pile of bodies and broken carbon fibre. These vets know what they’re doing. 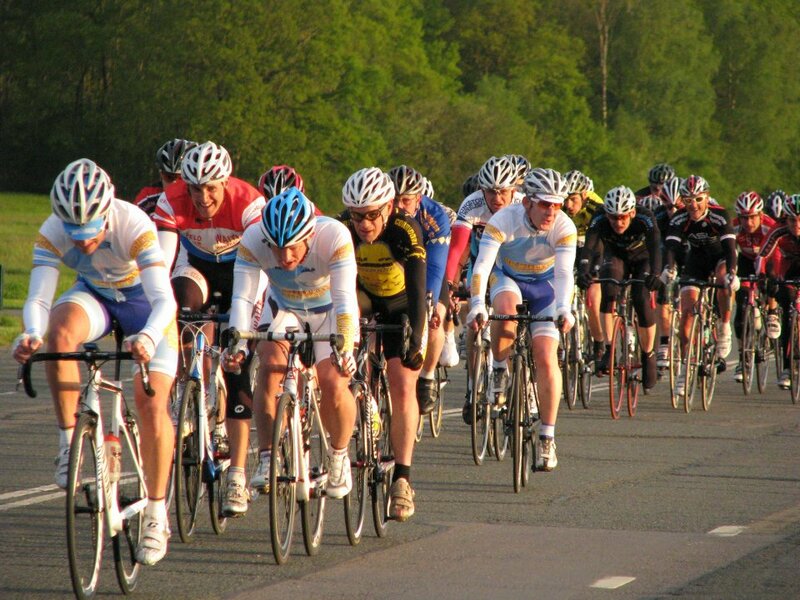 Sure, they’ll squeeze and intimidate you – it is bike racing after all – and if you leave the tiniest gap they’ll have it. But I saw none of the swerving, unnecessary braking and other dumb manoeuvres that frankly put the willies up me in the 4ths. Paul Webb, an online pal (and photographic contributor to the blog) whom I was delighted to meet for the first time at this event, raves about veterans’ racing and I can absolutely see his point. As I mentioned at the outset, the Dunsfold series is a new one this year and numbers are still building, but once word gets around I can see it being a roaring success. This, of course, will conversely affect my finishing positions, but hey, it’s not all about BC points, as was so amply proven last Wednesday. I promised a word or two about the previous Friday’s 4th Cat opener at Dunsfold. Here they are: forty-first. Shithouse. Another great article, I have enjoyed reading through all your old posts which have helped me a lot as I embark on my first racing season. I look forward to racing you tonight. A great post. Thank you. As a (young) vet all I can say is don’t underestimate some of the old blokes! Love it – obviously i’m not the only one fretting about crashing!!! The one-word description of your 4ths outing made me laugh, exactly the same word as Robbie McEwen used in a Cycle Sport interview a while ago – and sums up a bad day at the races perfectly!